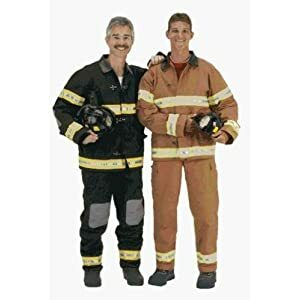 Find mens firefighter costumes to buy for Halloween through Funtober. 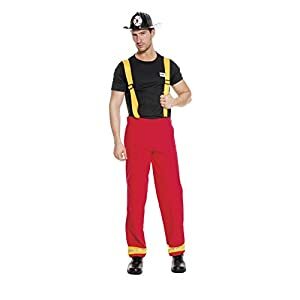 Low prices, fast shipping and great selection of firefighter costumes. 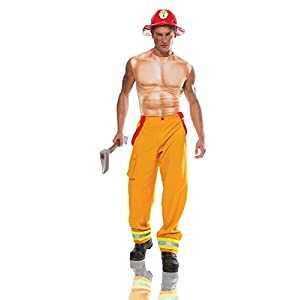 Start shopping for a mens firefighter costume for sale for this October today. 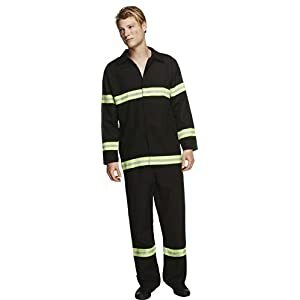 Adult Size Mens Large (42-46) – Mens 2X-Large (50-52), approx ages 18-88. All measurements provided by Underwraps and are approximate. Based on the best known sizing information. 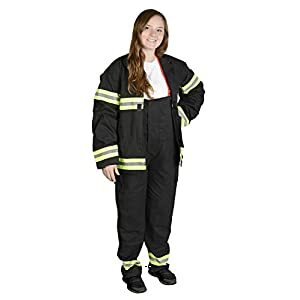 This posting includes: Includes jumpsuit with embroidered patches as featured. 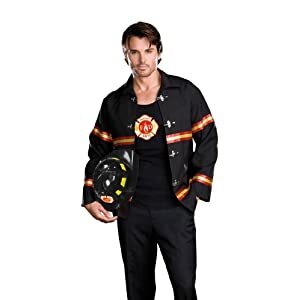 This adult firefighter costume includes a jacket with reflective detail and matching pants. 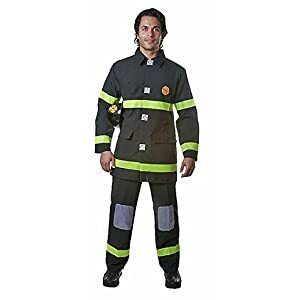 The helmet is sold separately from the firefighter costume for adults. 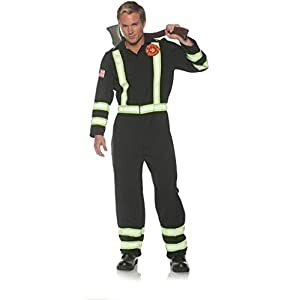 Includes coat with buckles, bib overalls with pockets, suspenders and hard helmet. 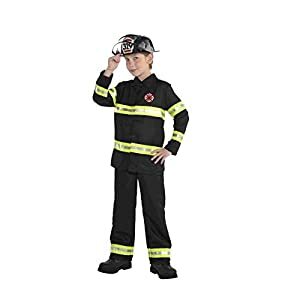 The Fire Figher Suit with Helmet comes in adult sizes Small, Large. Black long sleeve jacket with embroidered patches. Matching black pants with leather like knee patches and attached suspenders. Helmet also included. Trousers with braces. From our fever range. Includes knit tank top with Fire Department heat transfer. 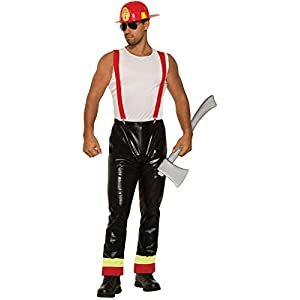 Includes Fire hat. Packaging will say Dreamguy. 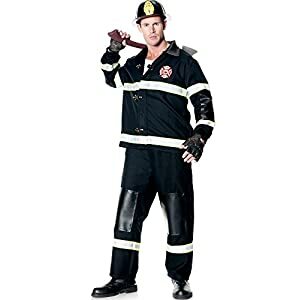 Product Comes Complete With: Jacket, Pants, Hood (Fire Helmet sold separately). 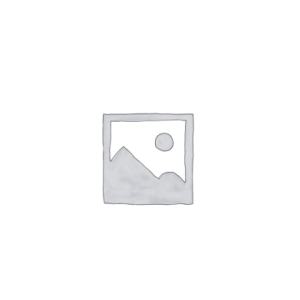 Set packaged in a deluxe garment bag closes with zipper for easy and secure storage. Realistic Looking with Embroidered Patches. 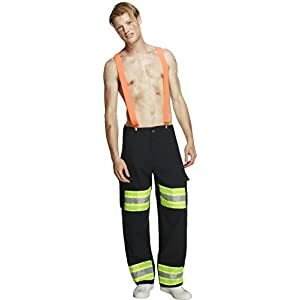 Includes pants with braces. Accessories also available. Exclusive Fever branded product. Reflective trim on pant hem. Adjustable suspenders.